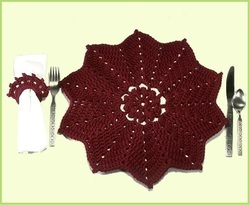 My original crochet pattern designs are now available as instant downloads! Click the "buy now" button to be taken to PayPal to purchase a pattern. immediately after checkout is complete. Don't have a PayPal account? Pay with a credit card instead. Simply follow the link from the PayPal page. All crochet patterns are in pdf file format and include complete step by step instructions and color photos. The patterns are written in U.S. terminology and standards. This is an easy crochet pattern that requires super bulky yarn and a size N (10mm) hook. I created this pattern to coordinate with the Rectangle Rug – my most popular pattern. It features a cobblestone stitch center, which is super cushy on your feet. This rug would be great for kitchens and bathrooms, or really any room in your home. It measures 27 inches across when worked as written, but I include very detailed instructions on how to make this rug any size you wish! The pdf file also includes complete instructions, color photos, Helps & Hints, and a yarn substitution guide. This pattern looks difficult, but it works up very quickly -- you could make your rug in a weekend! With this easy crochet pattern you have two choices - make your book cover with vinyl flaps, or use the included crocheted flaps pattern. It's 2 patterns for the price of one! Also included is a full size template and instructions to make your vinyl flaps. Why bother with vinyl flaps? Because they are less bulky, and I also like to stick notes inside that are easily readable - but it is your choice. (7" high x 4 1/4" wide) of various widths. This crochet pattern looks difficult but it actually works up very quickly -- you could make your rug in a weekend! I made myself one for my bathroom and I really love it. The center is a cobblestone stitch which feels nice and cushy on your feet. This rug would be great for kitchens and bedrooms, or really any room in your home! Easy Pattern. Finished size of your rug will be 30 inches (76 cm) wide by 20.5 inches (52 cm) tall using super bulky yarn. I also include yarn substitute information at the end of the pattern. make a tablecloth to match! These gorgeous placemats are perfect for everyday, and also add a special touch to any holiday table! 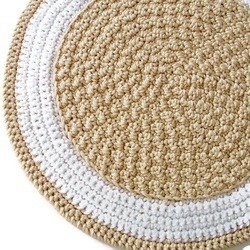 Easy care, machine wash and dry when made with acrylic yarn, these placemats work up quickly and will last for years. And the napkin rings are easy to make and add that extra special touch! ceiling corners (up to 3.5 inch diameter). This is an easy crochet pattern that works up quickly using acrylic yarn, and you have 3 options for your duster cover: looped, fringed, and/or fuzzy. Don't worry, there are no tedious fringes to make, the entire piece is crocheted using the loop stitch. 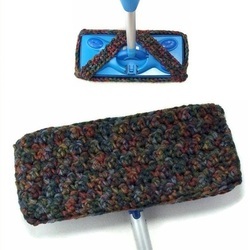 The pattern is designed to fit Swiffer handles, both regular and extendable sizes, at a length of 6 inches, (measurement of handle top only, where the cover slips on). This pdf file includes complete step by step instructions, color photos, an abbreviations list, and detailed instructions for making the loop stitch, also with step by step photos. If you follow my directions for the loop st you will easily be able to keep them a consistent size. It is a very easy st once you've mastered it, and it doesn't take much practice at all to learn. These covers are quick to make, and easy care - simply toss in your washing machine to clean. Machine dry too! This is an easy crochet pattern that works up quickly using two strands of worsted weight acrylic yarn (you can also use cotton yarn if you prefer). The pattern is designed for a 10 inch mop/duster head, (like the Swiffer and O'Cedar Mops) but can be easily adapted for different sizes. 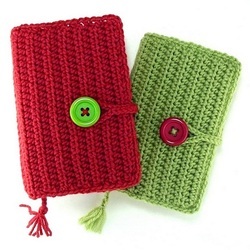 The pdf crochet pattern includes complete instructions and color photos. 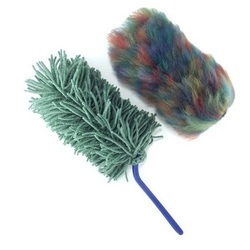 This duster cover replacement fits snugly to your mop or duster head. No more loosey goosey dusters that just won't stay on! Perfect for hard surfaces, this duster traps dirt and debris without scratching floors. These are quick to make, and easy care - simply toss in your washing machine to clean. Machine dry too! Star Wash Cloth and Face Scrubbie Pattern – Includes BONUS Symbol Crochet Charts! This is an easy crochet pattern that is worked in rounds and is challenging enough for the intermediate crocheter and yet is also great for beginners. By following my instructions, and using stitch markers (safety pins or paper clips work great!) as described , you will see how easy it is to work in rounds. If you've ever thought you couldn't work in rounds - then this is the pattern for you! This pdf file includes complete step by step instructions for the star wash cloth and also the star face scrubbie. 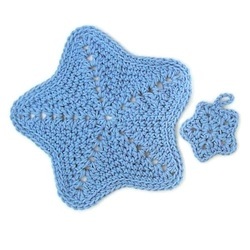 As an added bonus, also included is a complete crochet symbol pattern chart of the star scrubbie, and a 3/5th representation of the star wash cloth. I created these charts on the computer, and used 2 colors so each round is easy to see. If you are a visual crocheter, you will love them! These baskets are a cute decorative item for any home. Soft sided, yet sturdy, they will hold your small trinkets and treasures. You could also fill them with potpourri and place them around your home. 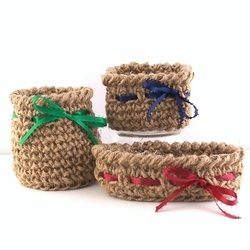 The round basket makes a wonderful can cozy, and will also hold drinking glasses - no need for coasters with these! Easy + pattern. Finished size of your completed round basket will be 3 1/4 inches (8.3 cm) wide x 3 1/2 inches (8.8 cm) tall to give you an idea of sizes. This is an easy crochet pattern worked in the round that requires worsted (medium) weight yarn (two strands held together for extra thickness and warmth) and a size K crochet hook. A Quick to Stitch project includes complete instructions and color photos in a pdf file. The finished size of your pet blanket will be 19 inches across, and I also include easy instructions for you to customize your blanket and make it as large as you wish. Very easy care (machine wash and dry using acrylic yarn), and your blankets will become even softer with repeated washings. I have blankets I made for my own pets that have lasted many years. These are great for covering furniture and your pet will appreciate having her very own blanket. 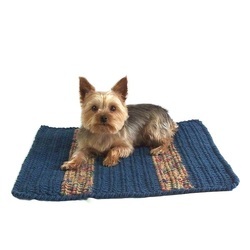 I like to keep one in the car for traveling and they can also be used in a crate or as a pet food mat. Cats especially love to curl up and sleep on these! This is a beginner crochet pattern that requires worsted (medium) weight yarn (two strands held together for extra thickness and warmth) and a size K crochet hook. A Quick to Stitch project includes complete instructions and color photos in a pdf file. 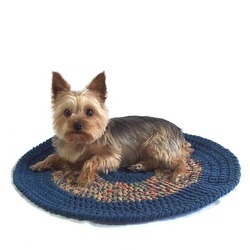 The finished size of your pet blanket will be 19 inches across by 19 1/2" tall. I also include easy instructions for you to customize your blanket and make it as large as you wish. Cats love these swirly toys and small dogs love them too! 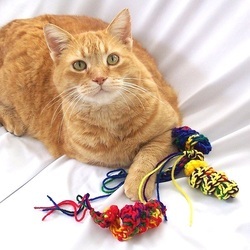 Make some fun gifts for your pet, and best of all, when they get lost under the furniture, you can crochet new ones in no time! This is a beginner pattern. Finished size of your completed toys will be approximately 10 1/2 inches (26.6 cm) long using medium weight (worsted) yarn. This is a beginner crochet pattern, perfect for those who are just starting to work in rounds, or for those who just like an easy pattern. These gloves can be made with regular or soft worsted weight yarn, or with the yarn I used in the pictured sample project. 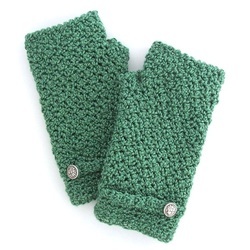 I include photos in this pattern of gloves made with each different yarn. I also include an easy alternate pattern for a different look. And as always, this pdf file contains detailed complete instructions, helpful hints, abbreviations used, and color photos. The finished size of your gloves will be a ladies large. 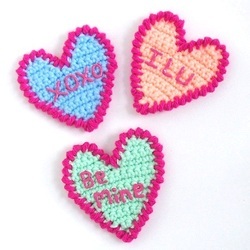 You will require a size H (5.0 mm) crochet hook, 2 buttons, approximately 4 ounces of yarn, and a stitch marker. These gloves are really nice when you want to keep your hands warm while keeping your fingers free. A quick to stitch project, you could easily make a set for every color coat that you own! Meet the chickens of Red Berry Farm! Red Rooster has a colorful tail that he likes to flash around the barn yard, and Berry Hen with her gorgeous red comb is the apple of his eye. Baby EggB is a little shy and hasn't decided if he's ready to come completely come out his shell, but he's on his feet and testing the world. 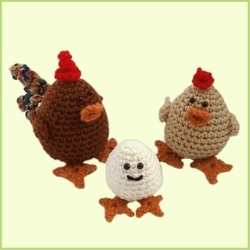 This item includes patterns for all three chickens. You get 3 fun patterns for the price of one! These are easy crochet patterns that require medium weight yarns and sizes G and H crochet hooks. Includes complete instructions and color photos in a pdf file. Red Rooster measures 5 inches tall including comb, and is 3 1/2 inches wide to give you an idea of sizes. Who doesn't love cake?! This cute and whimsical potholder is a really fun project and quick to crochet. You'll need 100% cotton yarn and sizes G and F hooks to complete this intermediate pattern. The finished size of your potholder will be 6.5 inches (19 cm) wide by 6 inches (15.2 cm) tall. This pattern includes complete instructions and color photos in a pdf file. My patterns also include a Helps & Hints section to explain and show (with photographs) techniques and steps that may be unfamiliar to you. Also included are explanations of special stitches and a list of abbreviations used in the pattern. This would make a great gift for birthdays or any celebration. Choose different yarn colors for different “flavors”. 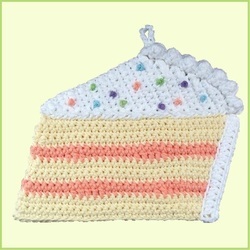 The potholder is reversible so you can “decorate” the frosting to suit your “tastes”. They also look cute displayed in a kitchen and make a fun and useful gift! This potholder would look cute displayed on a kitchen wall. 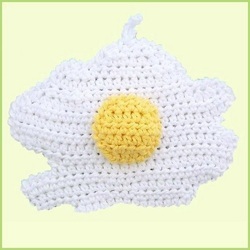 It is a fun and useful gift to make for yourself or for anyone who appreciates the “sunny side” of life! Easy pattern. Your finished potholder will measure 7 3/4 inches (19.6 cm) wide x 5 1/2 inches (13.9 cm) tall using medium weight (worsted) cotton yarn. 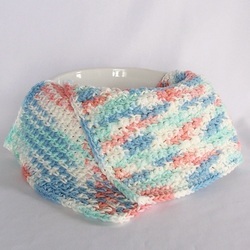 This is an intermediate crochet pattern requiring simple color changes and embroidery. Requires 100% cotton yarns and a size G hook. Finished size of your potholder will be 6 3/4 inches (17 cm) wide by 7 1/2 inches (19 cm) tall. 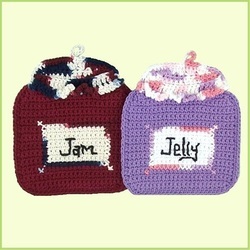 This pattern includes complete instructions, color photos, and embroidery charts for both the Jam and Jelly labels in a pdf file. My patterns also include a Helps & Hints section on the last page which explain and show (with photographs) techniques and steps that may be unfamiliar to you. Also included are explanations of special stitches and a list of abbreviations used in the pattern. 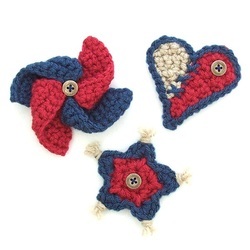 Three patterns for one great price :) And these americana appliques are the perfect embellishment and so easy to make! Sew them onto purses, scarves, tote bags, backpacks, hats, or anywhere you like. You can also add a pin back to your appliques to make cute pins, or glue on a magnet to make refrigerator magnets (fridgies). This is an easy crochet pattern that requires worsted weight yarn, a size F crochet hook, and puffy fabric paint. Finished size of your completed hearts will be 3 inches (7.6cm) tall by 3 inches (7.6cm) wide. Includes detailed instructions and photos in a pdf file. Also includes my special tip for painting letters on crocheted fabric without distorting the letters. Sometimes the simplest stitches and a simple project give me the greatest satisfaction. 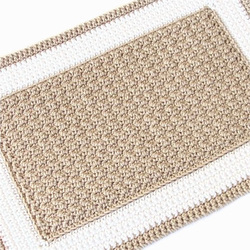 These easy dishcloths make a great carry along project and are quick to work up. They are a last minute gift idea and wonderful hostess gifts. You can use them in the kitchen or bath. Requires 100% cotton yarn and a size H (5.0 mm) crochet hook.